Studio B lighting was a much simpler setup. All the lights were on sliding pantographs, which had tracks running from one end of the studio to the other. The luminaires were mainly dual source again, but from what I remember the lighting circuits had switches on a panel in the studio, to allocate them to faders on the desk in the gallery. There was no memory system, and all changes had to be done manually. 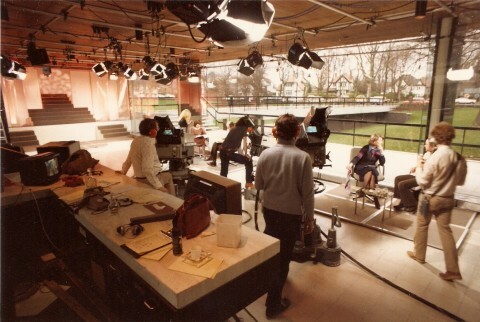 Considering the complexity of some of the programmes to be made in Studio B it was a testament to the ingenuity of the TM’s in arranging the lighting. One of the problems was that the height of the studio was insufficient in many cases to get the lights as high as would have been liked, and there was a real danger in some cases of tall people walking into lights where they needed to be fairly low to obtain the desired lighting effect. Pebble Mill at One Lighting, was all fixed, and before Gallery C was built there were no dimmers or lighting control. A series of scaffold bars were suspended from the foyer ceiling, and all the lights rigged on those or on floor stands. The “soft lights” were basically a set of 6 car headlight type lamps, and the key lights a variety of spotlights including some CSI discharge lamps. The latter had the problem that if you turned them off e.g. to reposition them, you had to wait 20 minutes before they could be turned on again.! The TM had to guess on how bright to light the area based on what he expected to weather to be like at transmission time. Too bright on a dull day would make outside look like night, too dark on a bright day would make the outside burn out on the cameras. The one time the TM could never win was when the weather was variable, with sun and clouds.